Staff - Charles J. Gruich, M.D. I've been fortunate to have Bobbi working as my office manager for the past five years. She has brought to the office a wide range of experience, knowledge and managerial depth to every aspect of the business side of the practice. Her professional experience allows her to efficiently manage an appointment schedule to reduce waiting times. She imparts her values, which we share, in a way that facilitates a patient's experience in our office with a view towards efficacy, completeness, compassion and patient sovereignty. Please feel free to call Bobbi regarding any business, payment or insurance concerns you may have, regardless of the nature of the problem. Like me, she truly believes that effective communication is key in every patient encounter. I couldn't do without her! I consider it a blessing to have Bobbi, her husband Paul, and their pugs Missy, Indie, and Pepper as my friends. Joy has worked for me since 2005 and came to the office only weeks after Hurricane Katrina hit the Coast, a time of turmoil when schedules were disturbed and bridges were out. Because of her demeanor, attitude, and superior skills as a medical assistant and master phlebotomist, she has steadied the clinical aspect of the practice beyond expectations. 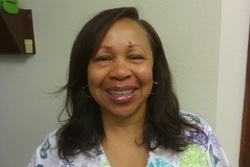 Joy's responsibilities include facilitating communication between the physician and the patient. She will be the person calling you about lab results and mediating messages to and from the physician. Joy is a very important part of our medical practice and her integrity, skills, and ability to effectively understand her patient's concerns is extraordinary. She's my "right hand!" I'm proud to have the acquaintance and friendship of Joy, her husband Roberto, and their daughter Natalia.